When summer begins we let the sheep with its lamb out to the mountains to eat freely. But it is also common to have a few lamb with no mother to go with, so we keep the lamb in the farm and give them milk from a bottle everyday. Most children love to do so and the lamb loves the attention from the children. When we have guests with children we ask if they want to help give the lamb milk. 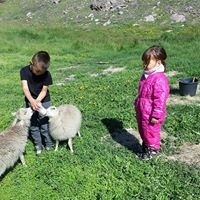 In the picture you can see our daugther Kimmernaq together with her cousin Nicklas feeding the lamb. You are also able to rent a horse and room in the guesthouse if you like to be on your own. In june and August you are able to stay as long as you wish to and go riding whenever you like to. We can drive you to the village to buy food for your stay and you can choose a horse you like and the equipment you prefer. 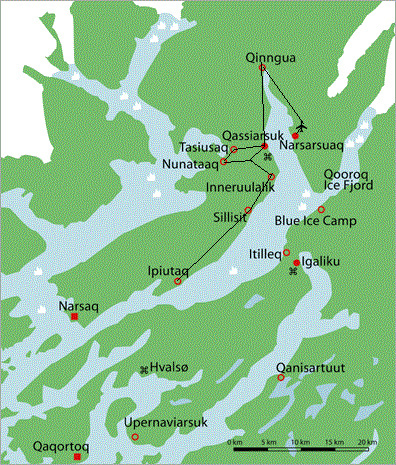 For internet you can go to the blue house and when we go sailing to town you are welcome to join.